What is the Rio Grande Rift? Is there a risk of earthquakes in or around the Rio Grande Rift? Could there be volcanoes around the rift? Did the Rio Grande River create the rift? No? Then what did cause the rift? How are scientists studying the Rio Grande Rift? What does a GPS station look like? What have scientists discovered so far? 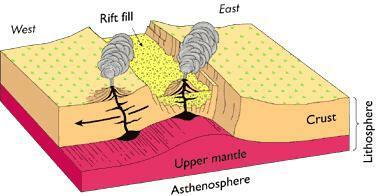 A rift is created when the Earth’s lithosphere (the strong "skin" layer at the surface) stretches and thins. Rifts typically have an elongated valley bounded by faults and a thin crust. The Rio Grande Rift began forming between 35 and 29 million years ago when Earth’s lithosphere began to spread apart, triggering volcanism (volcanic activity) in the region. It stretches from the state of Chihuahua, Mexico, to at least Leadville, Colorado (and probably continues further north). Continental rifts like the Rio Grande form basins (topographic depressions) that fill with sediments over millions of years. In Albuquerque, New Mexico, the basin sediments are three miles thick. The Rio Grande Rift continues to widen very slowly today. Back to the Rio Grande Rift main page. Depiction of a cross-section of a rift. Image courtesy of the USGS. 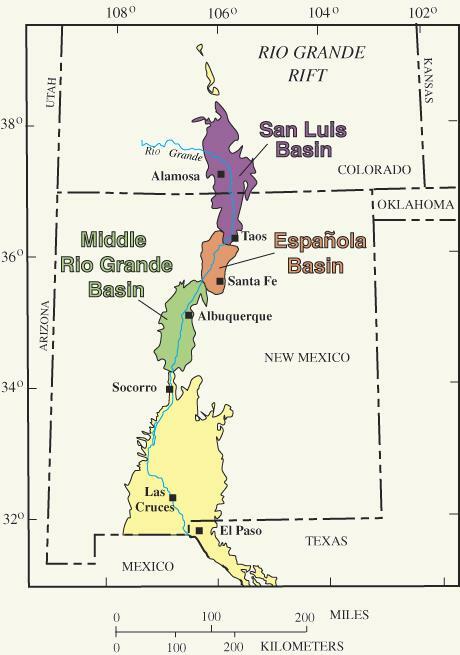 Map of Rio Grande Rift region (above) showing the primary basins of the rift. Image courtesy of the USGS. Most rifts are found along mid-ocean ridges. Only a few are located on land, such as the Rio Grande Rift, East African Rift (sometimes referred to as the Great Rift) and Lake Baikal, a lake-filled rift in Russia. Oceanic rifts are typically found at divergent plate boundaries, where plates are moving apart. 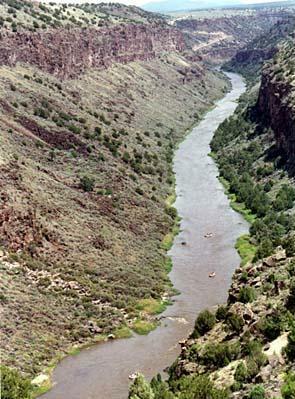 In contrast, continental rifts such as the Rio Grande are not located at plate boundaries. These continental rifts form in “extensional tectonic” settings in which Earth’s lithosphere thins and weakens due to the rising of hot rock deep below the surface. There is geologic evidence that multiple major earthquakes (7.0 to 7.5 magnitude) have occurred in Colorado and New Mexico within the past 15,000 years. Although it is less likely to have large-scale seismic activity than regions such as the San Andreas Fault in California, a large earthquake (7.0 magnitude or larger) will occur in the Rio Grande Rift area at some point in the future. 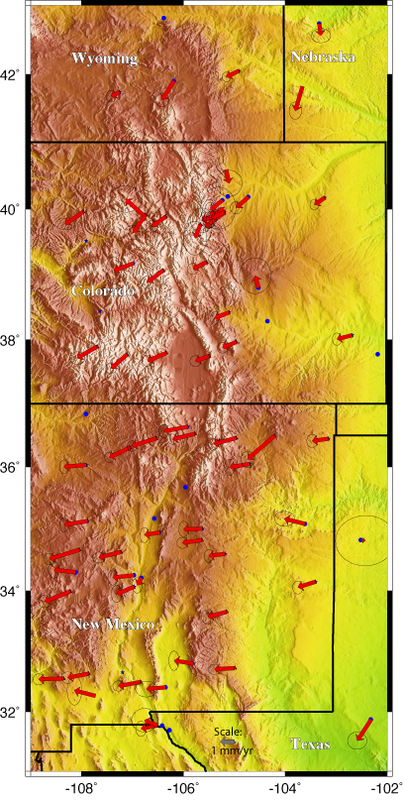 Throughout New Mexico and Colorado as a whole, seismic activity associated with earthquakes is considered to be low to moderate, with a slightly higher risk in and around the rift region. However less is known about seismic risk here than in most of the rest of the western U.S. There's more information on Rio Grande Rift seismic hazard here. Intense volcanism has occurred in the region since the onset of rifting millions of years ago. For example, Valles Caldera near modern-day Los Alamos, New Mexico, is one of the world's largest and youngest calderas. It was created 1.2 million years ago by collapse of a magma chamber during a large "supervolcano" eruption, similar to those postulated for past Yellowstone eruptions. Geologists consider the volcanic features in the rift region to be dormant, not extinct, and measurements of ground surface motion show that processes associated with magma intrusion continue under Valles and within the Soccoro magma body. No. The Rio Grande Rift was formed by extension of Earth’s crust. Crustal thinning and normal faulting associated with the rifting process formed topographic depressions or "basins" that captured small creeks and streams, and gradually directed drainage along the rift axis. As water progressively incised (cut through) the rocks, a river formed. Today's Rio Grande River flows from its headwaters in southern Colorado through New Mexico along the route established by tectonic rifting before turning east along what is now the border of the United States and Mexico, and then into the Gulf of Mexico. If the river didn't cause the Rio Grande Rift, what did? Imagine that you are inside a huge balloon, and you press your hands outward against the membrane. From the outside, it would appear that the membrane bulges up and stretches where you are pushing it. Rifting is similar, except that the "balloon" is the Earth, the "membrane" is the lithosphere (the cold, strong outer layer of the Earth), and the "pushing" is done by hot, buoyant rock underneath instead of invisible hands. However, there is much we still don't understand about how and why the buoyant rock got there in the first place, or the details of why volcanism and faults are where they are or what that may mean for future earthquakes and eruptions. That is why scientists are studying the rift further! Movements across the rift are small and slow (about 2 millimeters per year), so scientists are using a new technology to find out more about the rift. 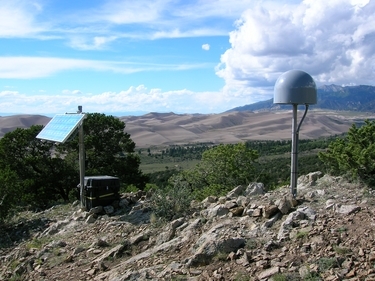 A team of scientists from the University of Colorado, University of New Mexico and Utah State University, with funding from the National Science Foundation's EarthScope Program, measure movement in the Rio Grande Rift by observing global positioning system (GPS) instruments in a network that runs from the central Colorado Rockies into southern New Mexico. The team is seeking to determine whether GPS instruments, which rely on satellites for their measurements, can accurately measure the miniscule movements of the Rio Grande Rift. What seismic hazard does the Rio Grande Rift pose? How wide is the rift, and how does the amount and rate of deformation vary along the rift from north to south? Site locations in the Rio Grande Rift GPS network are shown as triangles; the red triangles installed for this study have been collecting data since 2006. Plate Boundary Observatory stations are shown as blue stars. Locations of other GPS network sites are shown as blue circles. Rio Grande Rift GPS station at Great Sand Dunes National Park. Photo courtesy of UNAVCO. The stations have a steel tripod structure or a single steel mast that is drilled into bedrock and supports a GPS antenna. There is a steel box to house electronics and a small bank of solar panels. More details can be found here. A member of the project team visits each station every three to six months (after the landowners have been notified) to download data and service the equipment. The stations will be operational until at least 2014. After that, the network likely will either be continued via NSF funding for the project scientists or become part of EarthScope's Plate Boundary Observatory (PBO). Movements across the rift are small, ranging from about 1.5 millimeters per year of east-west stretching across northern Colorado to about 2.5 millimeters per year across central New Mexico. Surprisingly, the rifting is very wide: at least 300 km (180 miles) across, and we did not put sites far enough east to capture the eastern edge of rifting. This is surprising in that the Rio Grande rift is considered by scientists to be a type example of a "narrow" continental rift, with the Basin and Range province of western Utah and Nevada being an example of a "wide" continental rift. But rifting in the Basin and Range is focused at its edges. By comparison, rifting across the eastern Basin and Range province in the vicinity of the Wasatch fault, Utah, is about 3.8 millimeters per year focused within a distance of only 120 km! For an education kit about rifts in general and the Rio Grande Rift in particular, contact Mark McCaffrey. There is also more information about the project and its objectives at the Rio Grande Rift main page. Red arrows show directions and rates of motion of GPS sites in the Rio Grande Rift; the grey arrow at bottom represents 1 millimeter per year of motion for scale. Motions are shown after subtracting stable North America plate motion. An (outdated) pdf version of this faq is available here.